Thai New Year officially began on Monday of this past week, kicking off several days of hijinks, waterlogged afternoons and clay-smeared evenings. After last Saturday's deadly protests here in Bangkok, I was curious to see how the notoriously wild festivities would unfold, but made the mistake of approaching the situation with a culturally dissonant, Western point-of-view. Given that it was sandwiched between a calamitous army crackdown and the red shirts' promise to occupy Bangkok's commercial area until Parliament was dissolved, I thought that perhaps the traditionally raucous celebrations of Songkran would be muted. Have I ever looked so happy in a photo? I don't believe I have. 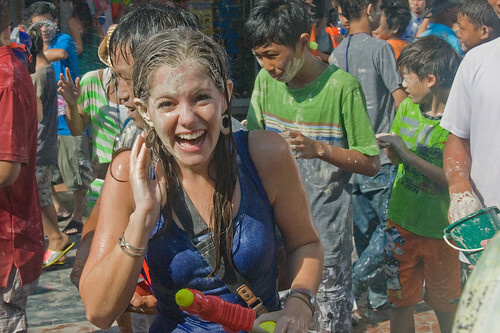 Photo from Gary Arndt's Songkran 2010 album. Yes, over 20 people were killed during last weekend's army crackdown, but as one of my Thai friends said "in Thailand, there are worse things than death." As a result, the attitude toward Songkran was the same, if not more concentrated: respects were paid to those who had died, makeshift shrines were set up adjacent to one of the main festival areas for Songkran, and the celebrations kicked off, despite a statement from the city to the contrary.